One of the 'must dos' while planning any trip is to research on the best eating place in that city. I did the same when I had been to Mangalore on a recent trip. On reaching there, I couldn't help, but admire the tall coconut trees swaying in the summer breeze as if performing a well-choreographed dance. The rivers forming a neat maze, and endless number of jackfruit trees almost seducing you come over and pluck a ripe fruit. A sight, anyone from the concrete jungle would die for. But for me, deep down, something was not complete; the fabled Mangalorean cuisine was yet to show up. The first two days passed by and I was getting worried. Very worried. Almost wondering if the trip would end without exploring Mangalore's cuisine? What a waste! We had planned a trip to a place called Karkala. On the way back home, our tummies started growling and somehow everyone in the vehicle said in a single chorus "let's stop for tea and goli bajje". Wow!!! That was the moment I had been waiting for. Goli Bajje, the first of the many culinary adventures that followed. 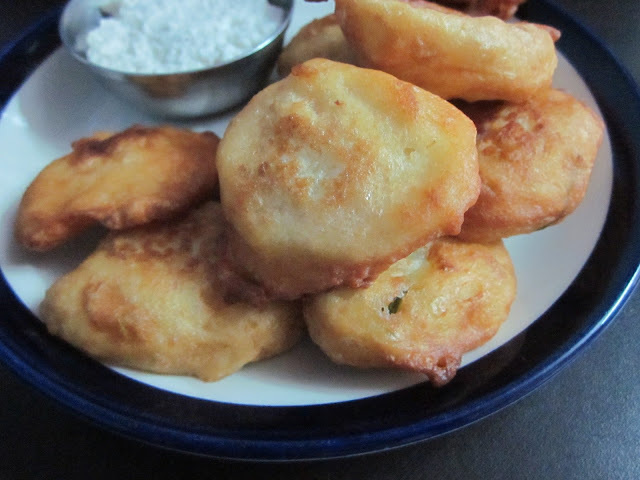 Goli Bajje (goli- round & bajje- fried) is another snack from Mangalore. It’s stature in the minds of all Mangaloreans is no less than what 'Vada-pav' is to us Mumbaikars or what 'Sondesh' is to every Kolkattan. Available at almost all snack joints as well as fine dines across Mangalore, it is a hit with office goers and the college students who probably give the boring lecture a slip and sit in a college canteen hogging them by the plateful. Ask someone where you would get the best goli bajje in Mangalore and be rest assured you have stirred up a controversy. For me, I couldn’t have timed this post better. With the rain Gods being benevolent (and surprisingly on time this year), a lazy week end and an India- Pakistan cricket match on TV, all you need to do is make yourself a hot cup of coffee and a huge tubful of these babies and curl on the couch whilst watching your favorite movie or sport. I got this recipe from my aunt in Mangalore, honestly, there’s no fixed recipe to make goli bajje, each house has its own proportion for the ingredients. Play around with the spices to suit your taste. I got a big thumbs up for this recipe from my mum and sister. And yes, at the restaurant where we stopped to have Goli Bajje in Karkala; we lost count of the number of plates we ordered. Absolutely delicious! Few curry leaves, roughly shredded. In a large mixing bowl, sieve together the maida, besan and the baking powder. Add the curd and mix well slowly incorporating air into the mixture. Add water bit by bit until the mixture comes together. The mixture should be of a thick pouring consistency. Add the chilli, ginger, coconut bits and salt. Mix well and let the batter rest for atleast an hour. Heat oil in a pan on medium heat. You could test the heat by dropping a bit of the mixture in the oil. The batter should rise to the surface. It is important to keep an eye on the temperature of the oil as overheating the oil will result in the possibility of the inside remaining uncooked. Now, take a spoonful of the batter and let it slide into the oil. Repeat the process for the remainder of the batch. Once a nice golden brown colour is obtained; remove and drain on an absorbent paper. Enjoy hot with equally hot coffee or tea and chutney.